LinkedIn is an amazing resource for B2B lead generation -- If you know how and don't mind doing some work! Most small business people are on LinkedIn, but many have never gotten any leads. One reason is that people think of LinkedIn like other social networks. They try to amass connections, but nothing happens. It's not about how many connections you have. There's a better way, and I'm going to share our LinkedIn Lead Generation Formula! For effective sales or marketing, you need to know who would be a great prospect. This is especially true on LinkedIn. For our clients, we usually create one or two Personas that describe their ideal prospect. Let's say you have a product that is especially valuable to hotels, but you only serve Dallas, Texas and the surrounding area. Try this: Log into LinkedIn and click the advanced search button. Click Search. I got over 2,800 results. Now all of these may not be perfect prospects, but they are all in your target industry and your target geography. And, each of them almost certainly knows several of your perfect prospects. Your prospects have problems and business challenges, and you have valuable knowledge. If you were an expert in staffing for hotels, and you knew how to find reliable employees, don't you think most hotel managers would want to hear from you? So let your prospects know your tricks! Are you worried that you won't be able to sell your services anymore once you tell prospects what you know? Well, don't. It's almost always easier and cheaper to hire an expert. But first, you have to let your prospects know you are an expert! Content can mean many things. Videos, Blogs, PDFs, eBooks, Info-Graphcs, Photos, MP3s -- Anything that communicates. You know your prospects, so you know what they would appreciate. Knowing your prospects and creating valuable content -- That's what you do for any Inbound Marketing campaign. It's a common problem that small businesses have. They put up a website or blog, but nobody comes to see their great content. You can have the best content in the world, but it doesn't matter is nobody sees it. Time to build their network on LinkedIn -- Connections, Recommendation Requests, Responding to Questions, etc. Time to write the announcements for the groups, and the skill to do it correctly so that prospects find it valuable, not annoying. If you've got a modest budget, we'll do it for you. If not, subscribe to our blog because we plan to continue this series and tell you everything. You'll grow some, have a bigger budget, and decide it's better to hire experts like us! This is all nice, but does it work? 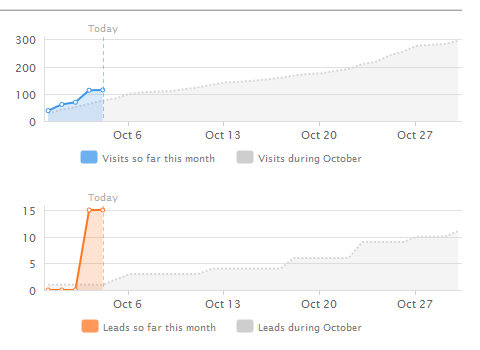 I'll share the actual metrics with you from a LinkedIn campaign we did internally in the fall of 2011. In one day, we got 15 leads. It kept growing, but we neglected to capture the graphs or I'd show you the rest. How many of you wouldn't love to get 15 quality leads a week -- Every week? These are typical results -- Not a special case. For a large business, that's not enough, but for most smaller businesses, you'll quickly overwhelm your sales team. Even better, these were very qualified leads. You can visit the Quickly Boost B2B Sales landing page. It's a good landing page, but a 50% conversion rate? The only way you get that high a conversion rate is to have great content and send very qualified traffic! Here's another thing that happens. Your LinkedIn visitors will vote for your content. Good results confirm that you are solving their problems and delivering valuable content. Who do you think they'll call when they need your products or services? The example below got 51 LinkedIn "shares" and 6 Re-tweets. The Twitter results came for free as we have our LinkedIn and Twitter accounts connected together. We weren't even focused on Twitter! Use LinkedIn correctly and you can connect your prospects with your content -- Everybody wins. Know your prospects -- Be targeted. Create valuable content that solves your prospect's problems. Announce your content on LinkedIn. Let your world know.